There's nothing like a Saturday morning seated at the breakfast table in your pajamas enjoying a home-cooked breakfast. Make our charming Amish Post Paddle Dining Chairs part of your country kitchen collection. 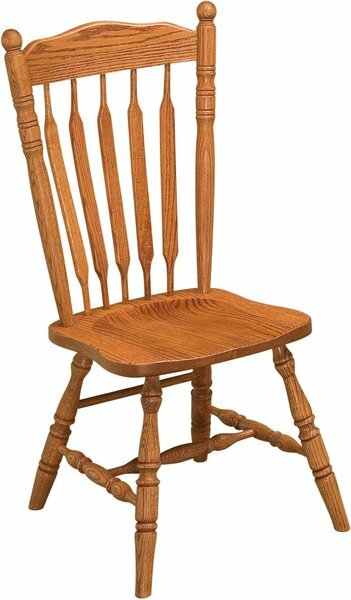 These lovely solid wood chairs feature beautiful chair backs comprised of paddle-shaped back slats. The Post Paddle Dining Chairs are shown here in oak wood, which is a popular choice for country style or farmhouse furniture. Oak wood is a heavy, strong and light colored hardwood that exudes warmth in any room. This farmhouse style furniture is available in a stationary bar stool or swivel bar stool version. Make your mealtimes and special family gatherings comfortable and stylish with these Amish made dining chairs. Be sure to view our Amish Double Pedestal Table to use with these solid wood chairs. Custom made for your American home furniture collection, all of our Amish designs come from woodshops in Pennsylvania, Ohio and Indiana. At DutchCrafters, you receive furniture of heirloom quality that will not have to be replaced but instead will be passed on to future generations to enjoy. Think of the money everyone will save! Select from nine different woods for these dining chairs with rustic versions also available. Choose the stain and the option to have an upholstered seat in leather or fabric. Call with any and all questions on our toll-free line, 1-866-272-6773. Our friendly Amish Furniture Specialists are ready to assist you.